The Minister for Schools, Nick Gibb has announced a new Model Curriculum for Music Education. It is needed because currently the curriculum for six years fits on one page. As it is so vague, some schools have been able to get away with teaching music through a few hymns at singing practice and a nativity at Christmas where you can’t hear your kids sing because they are singing to a YouTube video. Some of the stories I have heard from parents with young children are quite frankly appalling. No choir. No orchestra. No recorder group. No music lessons. No instruments. It’s easy for us in the Music Education Community to praise each other for the work we are doing and forget the places where NOTHING is happening. It is unacceptable and I am so happy the Minister is actually trying to do something to help by actually giving some sort of guidance. Reading music seems to be something incredibly controversial and something that only Tories do whilst testing and indoctrinating innocent, hungry children about something that is completely pointless. If I meet Gillian Jeffries from the tweet above, I will have a few words to say. I blooming well hope she is not a teacher. 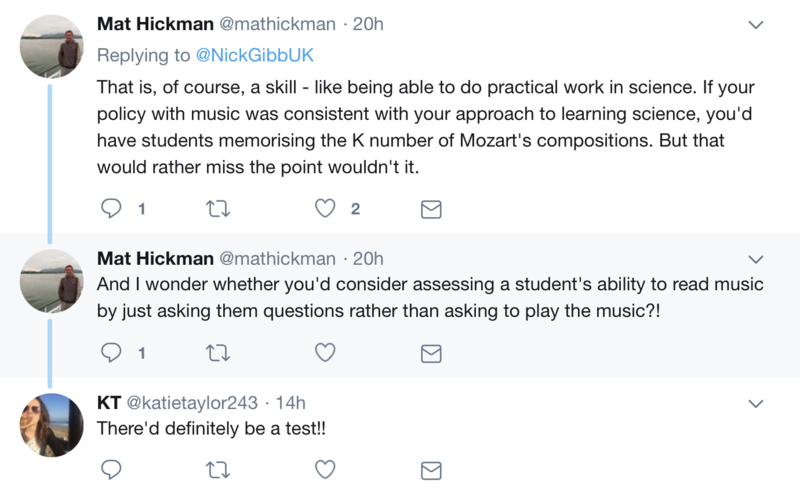 Yet, I heard some of these arguments from teachers and tutors on my Music PGCE twenty years ago and some from colleagues over the years. And from listening to some of the new generation of teachers, not much has changed. It seems there was a generation of teachers from yesteryear who just taught theoretical notation out of context from any sound. Surely, we have moved on from this? I teach notation when I teach recorder. I teach notation when I teach singing. I teach notation when I teach the children to play the Chinese Drums. I teach notation when I teach the children the keyboards. I teach notation when I teach children violins. And if you teach using the Kodaly method, notation is embedded in so much of what you do. The minister has brought together a whole load of experienced music teachers, headteachers, performers, conductors from all sorts of walks of life to improve things for children who have sod all music at school. And he gets this sort of cynical, pessimistic quite nasty reaction from people who should know a lot better. OK, this committee might come out with something useless – but hopefully they will actually do some things to improve matters. Here are a few of my own suggestions for the working party – I am quite hard-line so I doubt they will go along with any of these but they should be looked at. No school cannot have a choir (you may think this over the top, but Macron has done this in France. It is policy). Any school that is not teaching at least 45 minutes of music every week will be placed in special measures. I am pretty sure that would happen to the school if they had less than 45 minutes of English so it’s hardly controversial. Any school that does not have a trained music teacher on the staff must send a designated teacher on the Kodaly Spring Course, Orff course or Sing for Pleasure Summer School every year. This is where the extra funding the minister has promised should go. No school can complain if they are given the training for free. All B(Ed) courses to run Kodaly and Orff-based training and be entered for Level 1 for each. We could make up our own, but why bother when there are already some fantastic accredited courses out there. All B(Ed) students to be entered for Grade 1 on any instrument of their choice at the end of their course. If they fail they cannot get QTS. I hear groans but if you fail your maths test you can’t teach. Why should Music be any different? And if the teachers moan and say “I’m not musical” then immediately proceed to Point 8. All children to play recorder from Years 2-4. This will be mandatory, the same as teaching number in maths. There should be a government-funded scheme to give a recorder and book to every primary student who enters Year 2. Before people complain they hate the sound of the recorder, in some areas of Scotland every child is given a chanter. See my article on why recorders are important here. Singup to become free again and to publish books with the melody in to give to children for assemblies – not just the lyrics but the treble clef melodies. An information campaign to convince children, parents and teachers that music in schools has nothing to do with talent and is for all. This must also explain to parents how children should practice an instrument. In my experience, the vast majority of parents haven’t got a clue what practice involves, what it looks like and why it is important. Every school to have external artists come in at least once a year. Otherwise they will be fined. Before anyone complains about cost, ask the scouts or the Salvation Army to come in. They will do it for free and you might even be able to source some instruments. Support the Hubs. If a school has no information about the hubs or the majority of parents have no idea what they are then they will be downgraded one grade of their OFSTED report. Quite frankly, I have had enough of schools treating Music as a nice optional extra. We have been way too accommodating in the Music Education Community and it is time we supported the Minister whatever our political tribe and sort this out so we can have a generation of children getting a proper musical education. I have made a short Chinese Folk Medley of two Chinese songs “Ni wa wa” (My Clay Doll) and “Hong Tsai Mei Mei” (Rainbow Sister) for school orchestra ready for Chinese New Year. What was the “Wider Opportunities” project, now First Access, are the schemes that have been put in place where a whole class learn an instrument together, normally for a year. It came about after the Labour Education Secretary David Blunkett gave a clear commitment that every child should play a musical instrument in the Blair Years. Credit where credit is due, Blunkett stuck to his word and schools got a variable experience of each child learning an instrument together. I worked for a local authority music service that implemented this scheme so I have first hand experience of setting up, carrying out and evaluating these projects. I still run quite a few in my school now. I have blogged about this a few years ago, today’s blog is to explain what tweaks we need to do to make these projects work better. The basic idea is great. We all play an instrument together with an expert guiding us. The projects go wrong as soon as you encounter differentiation, practice, assessment, technique, logistics, accommodation, repairs, change in teacher, and a lack of aims. This sounds pretty stark but most of the projects have not been set up with enough thought concerning the little details. To get this right means we have to accept some uncomfortable things we would rather not deal with. It also means thinking about pedagogy and philosophy. Everything goes well in your First Access lessons for about half a term and most the kids are are the same level. You buy a book like “Fiddle Time Joggers”, or “Recorder from the Beginning” or “Standards of Excellence”. You project the music on the interactive white board. This is easy! The kids are all learning! Why the heck didn’t we do this years ago? After half a term, you’ve lost a third of kids who are struggling, a third think it is too easy and a third are kind of happy with what you are doing. You now have the Differentiation Problem and you have to come up with a solution that will appease children, parents, school leadership, the class teacher who is looking at you like a clueless puppy-dog and yourself. So you either 1) do nothing, 2) take out the more able to do something harder, 3) attempt to write a harder or easier part to what you are doing or 4) make new groups. This is pretty consistent for almost every type of instrument. I have taught classes of recorder, violin, cello, clarinet, trumpet, trombone, ukuleles, guitars, keyboards, djembes and Chinese Drums. 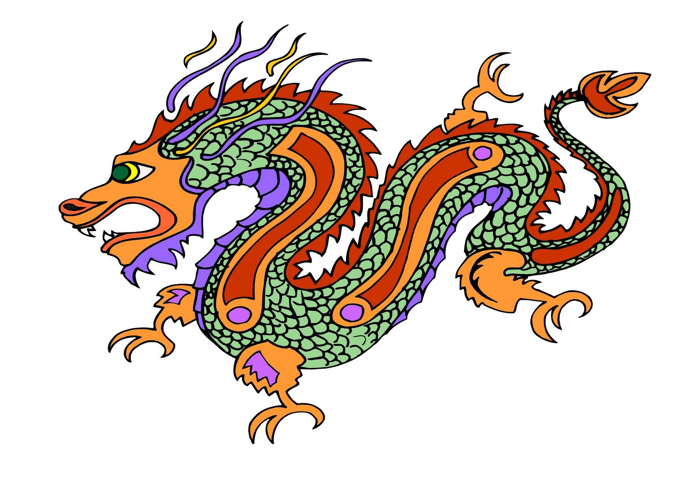 We all end up with the difficulties but it is less of a problem with djembes and Chinese Drums. The differentiation problem seems to coincide with difficulties with pitch and musical literacy more than rhythm. How do you teach good technique to thirty children? Those teachers who say it’s just the same as teaching one child or a small group are kidding you. It’s frankly close to impossible. The ways that work are 1) Teacher modeling, 2) Peer-to-class modeling, 3) Peer-to-peer modeling (paired work), 4) Outsourcing technique to an online teacher through a video. I go mainly for Number 1 first – I will show the technique myself. I then do Number 2 if a child has good technique and I want others to see it. Number 3 I use as a check – “look at the person next to you and see if you are doing it the same way, if you aren’t can you work out who is doing it wrong?” Number 4 is get the kids to watch a video of someone doing it right at school or at home. Another thing I do is put the children in four groups in lines (our children are in four houses) and get each group to play and adjust technique if the children are getting it wrong. I’m not assessing here, I’m just seeing that one child is playing A when it should be G and is mixing up C and D. It is blooming hard work and you have so little time to adjust technique. Everyone says they hate it rote learning these days but in this circumstance rote learning is your friend. Just instruct the children in small steps and practice it over and over and over. Remind children of the basics constantly and then most technique problems deal with themselves as the children self-correct. You would think that giving each child an instrument which they then play wouldn’t be that hard. You would be mistaken. The children forget them at home much more frequently than their PE Kit. They lose them. They sell them (yep, I am afraid I have experienced this). They mix up each other’s bows. They mix up each other’s mouthpieces. They leave them on the bus. Getting Instrument A to Child A in the right place at the right time is way more complicated than you would think. To solve this you need 1) Parent workshops, 2) Letters to class teachers, parents, 3) Countless emails, 4) Phone numbers for the local police and school bus companies. I say this in jest but I have had to do both of these things in the past. But the answer to all of this is 5) Spare instruments. If you don’t have five extra instruments for your First Access problem either cut your loses like myself and go bald, pull out all your hair or buy wigs. You would never believe where these instruments go. No wonder so few schools give instruments to the kids to practice at home. You are happy. You will be teaching in the school hall. Loads of space. But there is a hidden catch. Sometimes this hall is to be used for SATS. Indoor PE. Book Week. Book Fair. Year 2 Dinosaur Exhibition Week. If you think you will teach every lesson in the school hall, think again! And if your lesson is directly before lunch then you will be expected to put all the chairs out for the dinner ladies. The answer to these problems are to prepare two lessons. Number 1 is the school hall version. Number 2 is the classroom contingency plan. Your main difficulty is that no one will tell you to change room until the last possible moment. You will be told how you need to be flexible. When you are told this, stand your ground and explain that they have known for a year when SATs will be and all they need to do is see who has booked the hall and email that person and explain why they will need to change rooms. If you just accept the “be flexible” line then they will never ever think about you and you (and the children) will have to put up with a chaotic lesson every six weeks or so). Your contingency plan requires a CD player and a CD as you will be unable to log in to another class teachers computer in an unfamiliar room. Make sure the school have not thrown it out and keep a CD version of all your repertoire. If you need a triple insurance plan, make sure the school hasn’t thrown away the OHP. Keep a board marker in your pocket. Broken bows. Cracked reeds. Two thirds of a recorder. Ripped out pages of books. No resin. No shoulder rests. No valve oil. No spare strings. Those button thingies on the trumpet valves that keep falling off. Bridges collapsing. Pegs breaking. Missing tail pieces. Clarinet key pads that have worn out. The problem is that most teachers deal with this after they need repairing. Then you end up running around and making mistakes. Buying the wrong reed strength. Putting on 3/4 size strings on a 1/4 size violin. Finding out the bow you’ve bought was the wrong size and won’t fit in the case. The answer is to buy a tool box with a set of repairs and then review every year. I am afraid barely anyone does this. Another answer is to get a company to come in and repair instruments. We do this at our school at the same time the piano tuner comes in. I’m impressed with the brass man but I am not impressed with the string man. Like every external agency, it can be hit and miss. If you do not repair you will end up with kids that do not care and look after their instruments. People are mirrors. This was a major problem at our school – last summer I had to throw away thirty-five instruments for differing reasons. With more care from the string team this would have been less than ten. The reason so many of these great schemes fail is because we don’t have a common aim. When I started doing First Access we had a meeting with colleagues and the first disagreement we had was whether the point of learning the instrument was to teach the curriculum or whether the point was to learn the instrument. This might just sound like semantics, but some teachers were just teaching three notes for the entirety of the year but combining them with fun activities, singing etc. They were completely unconcerned with how well they were achieving on the instruments because as far as they were concerned that was not the aim. Their aim was to teach children what dynamics was, or what rhythm was and the instrument was a tool. As it was a tool it didn’t actually matter how good you got with it as long as you knew the basics of how to hold it. Other colleagues looked at this with horror – for them it was all about playing the instrument. How on earth could you go through a whole year only learning three notes. But both teachers were pretty consistent, they just had different aims. Our leadership solved this problem by giving a common aim. You can do this with curriculum documents but no one reads them properly. You have to put the teachers on the spot and the way to do this is to have A Big Concert. We used to put on the Big Concert at the Victoria Hall in Hanley in Stoke-on-Trent. It was a great experience for the children and as we had a common repertoire which we had to learn, it meant we ended up with a common aim. And this meant that we started to have some consistency with each other in the Music Service. I hope this lengthy post shows quite how complicated First Access is and how a simple statement by a well-meaning Education Minister can result in something actually incredibly complicated. I still think Blunkett was right. We can all learn instruments together and there can be a lot of good things that can come from this. But blooming heck it is really hard to do well. I’ve only learned many of these things from doing it day in day out for ten years. Most teachers leave after five years these days. The kids are the losers if we don’t get it right. We need to put a lot more thought into First Access, I haven’t even mentioned things like motivation and culture for a start. If anyone has some good or bad experiences, can you tell me in the comments below or on my Twitter feed. This is not a music post but about that which bores us all – Brexit. I didn’t vote in the referendum, I was working in Thailand and I hadn’t set up my voting registration. But if I had I would have voted for Brexit because I studied European Union in my Politics and Music course at Keele University (yep I know that’s weird!) and I know full well that the EU really is an organisation in favour of a supranational federalist Europe. That’s what “Ever Closer Union” means. I’m very suspicious of any organisation where you can’t democratically remove the people who make laws and I still believe in a sovereign nation state. I’ve changed my mind on Brexit because of Rory Stewart’s support for Theresa May’s deal. His argument is based, I think, on his experience in Afghanistan and Iraq making peace in civil wars. We haven’t had a huge amount of violence (although one MP was horrifically murdered in the referendum campaign) but there have been huge amounts of threats and pure nastiness everywhere. Brexit has divided families and communities. I know of teachers who refuse to talk to family members because of the way they voted. I am pretty much considered mad because I said in the staff room that I was in favour of Brexit. In some ways we have had a very public civil war and we are still very deeply divided as a country. Some people may change their votes and their minds but whatever happens it is still going to be a relatively close result if we have a second referendum. And whatever happens we will have some very, very angry people who can legitimately say that the government betrayed their wishes. Cameron very clearly said on millions of leaflets that the government would implement the referendum result. But two years on, this issue has gone beyond who is right and who is wrong. Brexit could be an economic catastrophe or it might not be as bad as everyone thinks. What is worse is that we are badly divided as a nation and we have to bring people together not apart. This means letting everyone lose. If one side has “won” we can’t unite. We are that broken, we are that divided. There will always be more calls for more referenda and more threats, more hate and more people with huge chips on their shoulders. We are still angry after two years and it doesn’t look like there is any consensus in parliament or with the general public. We all need to lose in the sense that we all need to take a hit if we are to unite again. That’s what happens in a civil war. We need to learn humility and that can only happen if we all compromise and accept that there is no consensus. Theresa May’s deal is not great. But it’s the only deal on the table. The EU might use it to trap us in the Customs Union but there are quite a few legal options for us if they really did try to keep us in. But all of this barely matters. Like Rory says, every option is a slight variation on Theresa May’s deal but now what is needed is for us to move on and implement the deal. We need to implement this deal because it is not perfect. We need this deal because nobody wins. We have to accept a dilution of our own views because half the population disagree with us. We have to get out of our echo chambers and accept we don’t have a monopoly on truth; that even if no one we know thinks differently to us, there is a community somewhere else in Britain where it is the exact opposite. I still think Brexit is not bad, I still think we can prosper even if we don’t get a deal. But I have changed my mind that we should implement hard Brexit because that is what the voters voted for. They didn’t. Half the country was divided. Brexiters need to take this hit. They need to know they will not get hard Brexit and they will have to pool some of their sovereignty. We have to stay close to Europe. But we must not cancel Brexit either. Even if our GDP goes up as a result and everyone gets free ice cream. If we do that we immediately legitimize every person who claims they have been betrayed. That’s how you end up with fascist governments and it is arrogant to believe that will never happen in Britain. The Remainers need to take their hit, there will be a Brexit and no second referendum. But we will stay as close to Europe as we can. This is why we need a deal – because we need to heal and we need time to see how we can move on together without alienating each other in the process. What will make Britain prosper is a united country and May’s deal is our first step in national healing. Christmas is a time to come together in families and in communities. Can we even dream to come together as a country? My father went to a very progressive boarding school, Dartington Hall that he would often rave about. This post is a personal post about how I feel it was not helpful for him, for any of his immediate family or for society in general. My dad left my mother before I was born and I was state educated in Plaistow in East London until my mother died of cancer when I was eight years old. I went to live with my grandparents, my dad’s parents, even though I never met my dad in West Wales. It was a very different life to living in a red-ant, damp-infested flat in Newham where we got burgled all the time. When my mum died they even nicked the hire-purchase telly. I went to two different primary schools in West Wales and then my grandparents sent me to a secondary boarding school when I was ten, although mine was a lot more traditional than my father’s where they didn’t have to go to lessons! Dartington School, where my father went was a sister school to the notorious Summerhill and had lots of fashionable (and rich) left-wing activist parents. My father went to school with quite a few children of leading politicians and social elites. One of the main attractions of progressive education is that it is child-centered, ethically sound and produces well-rounded individuals not shackled to the exam factory. I got to know my father after meeting him when I was 18 until his death about three years ago. What I can tell you about my father is that he was a bit of a mess and spent his life bragging and blagging in a series of jobs he had absolutely no qualifications for whatsoever. He ended up as an expert on healing backs through chatting to a doctor in a pub and going on a one day course and putting up a poster in his back room. He was a very interesting man, you could talk to him for ages about a whole load of different subjects but had absolutely no idea how to be a father. He was incredibly selfish and had absolutely no interest in other people unless he chose to help someone for his own prestige. He would never think of phoning you up and asking how you were – I only got to know him through sheer obstinacy. I was determined to know a little bit about this guy who was responsible for my existance. He thought everyone else was a fool and was uncharitable to anyone who did not 100% share his views. He thought working hard was stupid and a waste of time. He thought qualifications were pointless. He was against all forms of authority. He hated a huge amount of people, particularly Tories who were vermin. He had an inflated sense of his own importance. What has this to do with progressive education? Well my father was a mess for many reasons, including alcohol dependency but his values were a complete mess. And your values are part of your upbringing. And much of your upbringing is about the experience you had at school. My experience of school is as a life-line. I cottoned on about at the age of 14 that I wasn’t going to have much of a life without good qualifications because I saw children who were set to inherit businesses, houses and wealth. I knew I would get none of that and the only advantage I had was that if I worked hard I would get good grades. All schools have good and bad things about them. I went to a horrific boarding school where I was very badly bullied and one where it was a lot better. But we all got pretty good qualifications. And they can’t take that away from you when you pass your exams. You can choose what you want to do within reason. The main reason I have had a pretty settled professional life, is because I got my GCSE’s and A-Levels and I have to thank my school for the hard work of getting me through this so I can compete with those who inherit the world. The teachers were pretty good but nothing special. The lessons were pretty boring and uneventful. The reason I did well was because of two hours of homework a day and two summative exams for every subject every year so when we got to the “real” exams, it wasn’t anything too unexpected. You don’t fear exams if they are regular, normal things to expect. Those people who want to get rid of exams because they think they are unethical don’t know what they are talking about. They are one of the only fair things we have in schools. You all take them, they are based on what you learned though the course and they are all marked by someone you don’t know. My father didn’t get any qualifications. He had some success and thanks to the baby boomer generation’s advantages was able to buy a nice, cheap, detached house in a quiet village for an insanely cheap price in the 1970’s. But he ended up a very unhappy man, living in squalor after racking up many thousands of debts, losing his house, still thinking the world owed him a living and that everyone was a stupid fool. So much for progressive education’s values. What my father needed were values of responsibility, hard work, commitment, kindness, and integrity and you don’t get these from progressive education – you get these from a traditional education. You don’t get these values from schools where you don’t have to go to lessons, where qualifications are not seen as important, where it is child-centered so you can basically do what the heck you like. Those values can turn you into a selfish, unkind, uncharitable hedonist. We need to stop all the guff about education and focus on what really transforms people. If we truly believe in education as a way of increasing social mobility we need to think what people need to move ahead. And in the end, you get hired for jobs if you are qualified, and you keep jobs if you are a decent, hardworking person with integrity. And that’s all schools need to do. Teach kindness, the intrinsic values of working hard and help kids to get the best possible qualifications they can so they can compete with the social elite. Resources and accommodation matter. Funding matters. But I don’t care what a school is, whether state or private, LEA controlled or Free, urban or rural, rich or poor. I don’t really care who runs it and I don’t care who gets what job, who is promoted to what place or who is bossing who. What I do care about is that every school can help children get ahead and end up living fulfilled happy lives with positive social relationships. From what I have seen, you don’t get this with progressive education. At our school we have singing practice for all Primary year groups. I am currently doing Y3, 4 and 5 and it’s probably the best lesson of the week. I’ve developed an eclectic repertoire to achieve this. Here is a short sample of some of the things that have been successful. Firstly, I don’t spend a huge amount of time warming up. This is not considered good practice so you are best to ignore me here but unless you are aspiring to be a professional singer I don’t think we need to do too much. I start with something like the 1, 121 scale game, and some simple scales ascending and descending to different sounds. I try to make it fun but also use musical vocabulary so will ask the children to sing staccato ascending and legato descending and I will also use Italian terms to sing s scalic passages louder, quieter, faster or slower. Next I will do either a round or a partner song. Rounds I take from the book “Flying a Round” and partner songs I take from the book “Banana Splits” which is the best introduction to part singing I have seen. I put the notation for partner songs on the board and we spend a bit of time with detailed questioning like which part is singing at bar 7, or how many crotchets are in the entire piece. These questions are to encourage children to really look at the score and not just at the words. Learning to navigate a two part score is harder than you might think and normally has to be explicitly taught for anyone who is not having private instrumental lessons. Rounds that have worked well are “I like the Flowers”, “Land of the Silver Birch”, “Kookaburra”, “Calypso”, “Junkanoo” and “Boots of Shining Leather”. Partner songs that work well are “I hear the bells”, “Down by the Bay”, “Tongo” and for younger children “Sing a little song”. I also do some songs that you can have one large group singing an ostinato while the other group sing the melody. When you do this it is good to start accompanied and then take the accompaniment away. The children really get something special from singing practice when they can hear themselves singing unaccompanied in harmony. Some good songs for this are “Popacatapetl” and “Zum Gali Gali”. Next I normally put some songs from different countries if I haven’t already done it in the rounds or partner songs. I usually try to vary this with different accompaniments. Sometimes I will sing some African songs just accompanied by djembes, some Spanish songs with a guitar, songs with ukulele and sometimes some folk songs unaccompanied. I try to keep it live and use as little backing tracks as possible; it’s important to communicate to children than music takes skill and doesn’t just come out of a box. However, I do use good quality backing tracks if I need a bit of a break, or for a song as children are leaving so I can focus on getting them to exit safely, yet at the same time keep on singing till the very minute they leave the hall. The Outoftheark resources are very good for this, as are all the Singing Sherlock books. I try not to use too many YouTube karaoke tracks except for the last part of Singing Practice. The last bit is really what the kids have been waiting for and it is to sing some of their favourite songs. I do these accompanied by the piano and make sure I change the key so they fit children’s voices. I will play them the original, normally as a lyric video as some of the videos are inappropriate, but for performing at assemblies I will always play live. Some music teachers shy away from popular songs but in the end the singing assembly is the children’s – I have my aims but at the same time the children should be allowed the opportunity to sing songs they like. I choose these songs by asking the children what they would like to sing on Bus Duty. So far we have sung “Titanium” by Sia, “Faded” by Alan Walker, “This is Me” from The Greatest Showman, “It’s my life” by Bon Jovi, “The Final Countdown” by Europe, “Eye of the Tiger” by Survivor and one choice by me – “Country Roads” by John Denver. We need to promote country, we really do! It takes a bit of time to arrange some of these songs so they work with Primary aged children but it’s worthwhile. I’d never heard “Faded” until I was told it was a good song by the children and they really sing it beautifully. Some of the choices were interesting, “Eye of the Tiger” and “Final Countdown” are pretty old now but I think they have endured as they seem to appeal to energetic boys who are influenced heavily by their fathers! “It’s My Life” is also a bit of a strange choice but it’s a bit of a cultural phenomenon in China as everyone seems to sing it at karaoke. We are an all-through school and we get quite a few secondary students peeking through the window and they tell me they are a bit jealous that Primary kids get to sing some of these songs because they tell me they had “boring folk songs”. Keeping some of these “boring” folk songs is actually incredibly important to me and I think society as a whole, but the way to do it is to combine them with songs that the children really want to sing. Singing Practice is still a work in progress, my next steps are to get a small group of musicians to play with me so I might incorporate some drums, bass, guitar, ukes, recorders or orchestral instruments but this will take rehearsals and scoring, so this is a job for after Christmas. I would also like to do some recording because the children do rise to this challenge and produce some awesome singing. And finally, I couldn’t resist the temptation to “Rickroll”, so last year when I took Year 1 Singing Practice, I told them about this nice guy called Rick who was never gonna give them up, and never gonna let them down. Complete with actions. And it was good fun to Rickroll all of the Year 1 staff when I emailed them the lyrics! I wish I could show you the video of 120 five and six year olds singing Rick Astley, but we all know that the days of sharing videos with the kids in are over. Take it from me that they thought this was the coolest song of all time! I haven’t always worked in Primary Schools and I have taught Music in some tough secondary schools in the Midlands. I think it is hard for primary staff and staff in leafy secondaries to understand some of the behaviour that can happen in secondary school corridors when discipline has obviously broken down. I don’t like the idea of silent corridors. Anyone who knows me would think I am the last person to advocate silent corridors. I talk to everyone in the corridor. But I have experienced some dreadful assaults in corridors and the stampede which I am going to write about. Although one of the assaults I witnessed was absolutely dreadful and ended up with a child in hospital and blood everywhere in the corridor, it was the stampede in a different school that has chilled me. The assault was between two disruptive and difficult students who were intensively jealous of each other. It was horrific and it was premeditated. The stampede was different. A large group of Year 11 children were coming out ten minutes early from lessons and we had been told that no one could leave until the bell rang. The head had rightly seen that there was an issue and had decided we needed more presence on the corridors. She asked us to stand by the doors. Three staff were on two sides of the corridor and the children were coming down the stairs between us. The children on the front saw me (I’m a big guy) so went to the other door where a female member of staff was. They then basically charged at her so she had to open the door. She was knocked over and I couldn’t help as I was the other side of the stampede. She wasn’t pregnant thank God or that baby would have been toast. The children in the stampede laughed as they walked out the door. As far as they were concerned it was all a bit of fun and they had got one over the staff by being able to leave early by shoving us out the way. Even good kids had got caught up in the stampede. It’s just fun isn’t it? If that woman was pregnant and had lost the baby, and if I was one of those kids in the stampede I would have been mentally disturbed by what had happened. I am not sure I would be able to forgive myself for that. If we had silent corridors, most of the children would have gone with it. It would have isolated the main troublemakers from the good kids who would have nothing to do with it. And there were loads of kids who just wanted to learn. We have to let leadership teams do what it takes to protect children and staff from harm and for some schools, silent corridors is a kind way of doing this. They may decide to have silent corridors for a while or in perpetuity; it doesn’t matter – we should not be sniping from the sides and criticizing. No one is getting hurt, in fact it is designed to prevent hurt. Anyone who has experienced assaults or a stampede in a corridor even when it is staffed know why a school might decided to implement a silent corridors policy. It’s not for everyone. But I can’t think of any who do it out of a warped need to control children like some are saying, They are doing it because it is right for their school. Here is the Note Value Song (UK Version). Hopefully we will have an American one available soon!